After a scenic train ride through the mountains, we arrived in Hualien and checked into our hotel. Even better, the jetlagged among us were still awake! After eating a good lunch there at the hotel we decided to take a walk along the bike path that ran across the street from the hotel. Now, according to the map, our hotel should have been close to the ocean. And it was, but it turned out to be Hualien's shipping harbor, which is a good deal smaller than Keelung's, but it was noisy, ugly, and industrial enough. Heidi found a whale-watching spot on the map and tried to march us all the way around the harbor to it, but we were too tired (even me) for that. 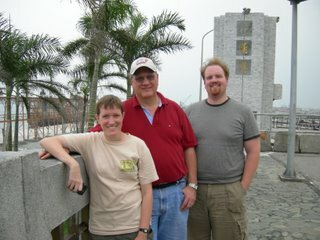 Here are my dad, Jon and I somewhere above all the construction and shipping docks.